Firestone Air Springs for most Australian Cars, 4WD Suspension, Suspension for Utes, Van Suspension, Air Bag suspension for trucks, Air Bag suspension for Vans, Air Bag suspension for trailers, Air Bag suspension for improved ride, air springs to level loads, air bag suspension for greater safety. Ride-Rite air helper kits from Firestone can be installed on most leaf sprung light trucks, Four Wheel Drives (4WD’s) and vans. Ride-Rite air helper springs are installed between the frame of the vehicle and the leaf springs providing load support through the use of air pressure. 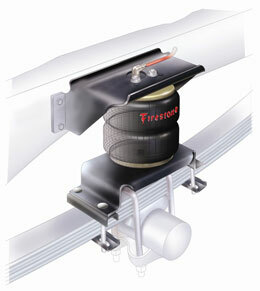 Firestone has made a commitment to provide the customer with the best air helper spring kits in the industry. Ride-Rite has become synonymous with quality, durability and with customer support truly second to none. Ride-Rite air helper springs utilize a pair of convoluted air springs. Most applications use the double convoluted air spring capable of 5000 pounds of load carrying capacity per set. It is extremely important to remember that the air helper springs do not increase a vehicles carrying capacity. Although the air springs are capable of lifting a great deal of weight, they are intended to maximize the vehicles load capabilities within the recommended Gross Vehicle Weight Rating. Applications for over 25 million vehicles. Keep the vehicle front end down – improve steering control, level headlight beams and improve tire wear. Level off-centre loads – individual inflation valves allow for adjustment side-to-side and front-to-rear. Reduce suspension fatigue – keep leaf springs from sagging under repeated or constant load. 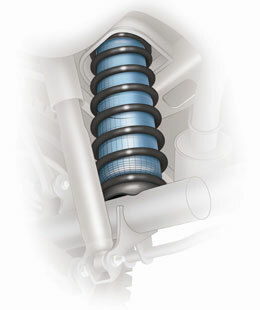 Air adjustment improves the ride – allowing the air springs to be matched to the load. Reduce bottoming out – protective air cushion softens contact between the axle and frame. Increase vehicle stability – absorbing road shock providing ideal ride conditions for passengers and load. Everything is included for a quick installation. Average installation time is approximately 2-3 hours. These kits, manufactured by Firestone relate to air over leaf applications and are suitable for most Utes, 4WD light trucks, and also for the front end of prime movers and buses. Easily installed without the need for special tools, kits are available now for vehicles commonly used and the basic kits may easily be adapted to suit other vehicles as required. We have various air accessory systems which enable you to have the perfect control over your air suspension. Firestone’s Coil-Rite air helper springs enable adjustment for varying loads and road conditions by inflating or deflating the air helper springs. Spring performance can be altered as easily as inflating a tire. Discover the difference Coil-Rite air helper springs can make in improving the ride, handling and braking of your vehicle. Coil-Rite air helper springs provide extra support for coil springs in cars, minivans, vans, light trucks, RV’s and SUV’s. The complete adjustability of Coil-Rite air helper springs gives your vehicle a smoother ride, more effective braking and handling, even under heavy loading, adverse road conditions or on rough terrain.